Best-selling author Jim Korkis brings forth from his famous Vault of Walt two dozen new stories about Disney films and theme parks, Disney stars and attractions, and of course, Walt himself. Disney fans and historians alike will relish these little-known tales. 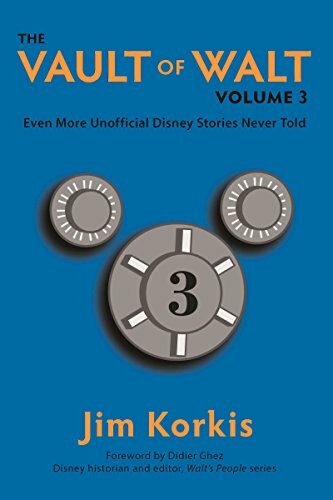 Now in its third volume, the Vault of Walt series continues to be the definitive source for Disney lovers eager to peek behind the magic and learn the spells that made the magic in the first place. Jim Korkis doesn't just tell the stories, he brings you face-to-face with the storytellers themselves, drawing on exclusive interviews and private correspondence. The only combination to this vault is a love for Disney and what makes it tick. If this is your first visit, make sure to also check out Vault of Walt volumes 1 and 2, as well as Jim's Who's Afraid of the Song of the South, packed with tales from the "adult-only" section of the Vault.